Caesar Salad is Elli's favorite salad. She is quite fond of the version at Pizza Antica. She loves the garlicky dressing and super crunchy croutons. So, when I was chosen to review a new Marzetti salad dressing I knew I had to try the Caesar to see if my girl Elli liked it. So I set out to make a salad. I grabbed the dressing and tried to open it. It wouldn't open. I turned it every which way. It wouldn't budge. I grabbed my handy jar opener. Nuthin. I tapped it on the counter, followed by whining and stomping while whispering obscentities. I finally got a bottle opener and pried it open which caused the lid to split in three pieces. I have no idea why it wouldn't open. It goes on fine now. Of course it is only half a lid. 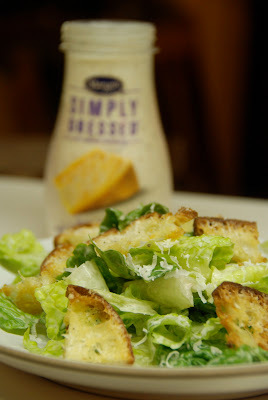 Thank goodness a Caesar salad is simple to make. I grabbed the Romaine, and proceeded to made a big salad with yummy home-made croutons, and fresh shredded Parmesan cheese. And the verdict? She liked it! It's a little more tart than she prefers, but she didn't have any trouble polishing off her salad. Don thought it was a little bland. hmmm. And me? I thought it was pretty good. It had a nice balance of flavors, it wasn't too garlicky, and had a nice zing to it. Don't forget the croutons. They're really easy to make. All you need is some good bread, olive oil and Parmesan cheese. Make extra because everyone will steal them out of the pan. Trust me on that one. 1. Grab a good loaf of bread. Ciabatta, French, Sourdough. It doesn't matter. Good bread is a must. It can be fresh. But stale bread works great too. 3. Set the bread pieces on a cookie sheet. 4. Drizzle with olive oil. Toss bread around in pan to coat. 5. Grate Parmesan cheese over bread. 6. Grind sea salt over cheese. 7. Bake in 450º oven for 5-10 minutes until lightly brown and crispy. To make salad: Toss the dressing with the salad, add fresh shaved Parmesan and divide onto plates. Top with crunchy croutons. Did I mention I was kidnapped by clowns? I was one of the bloggers selected by T. Marzetti Company and Clever Girls Collective to host a Marzetti Simply Dressed review. They provided me with product to test myself and compensation for my time. However, my opinions are entirely my own.